A range of products to ensure your outerwear remains in optimal conditions. Gore-Tex repair kits, zip lubricants and more will help to keep your outerwear in peak condition. To repair a small hole or tear in a GORE-TEX product using one of our GORE-TEX repair kits whilst out in the field, firstly clean around the affected area as much as is possible, smooth out any wrinkles and folds, and apply the self-adhesive patch carefully over the damaged area. These self adhesive patches should provide a temporary repair lasting around 5 home washes. 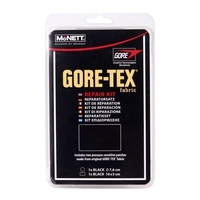 If you're able to repair your GORE-TEX product at home you can achieve a much longer lasting repair. Carefully remove any dirt around the damaged area using a soft cloth and rubbing alcohol. Apply the adhesive supplied with the kit, and then apply the patch, taking care not to create any wrinkles whilst doing so. Be sure to apply pressure from both the inside and the outside to ensure a thorough application. Allow around 24 hours for the glue to dry for the best possible result.